A new exhibition entitled Evaporation has opened at the Museum of Science and Industry in Manchester and will run until May 2016. Most suitable for late KS3 and KS4 students studying Science and Geography, the exhibition focuses on the importance of seas, oceans and tides, and is suitable for visitors over 12 years old. 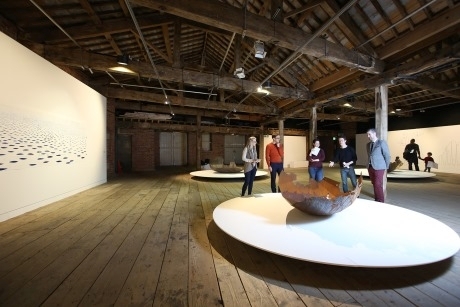 Evaporation features a range of works from sculpture artist Tania Kovats, including three large-scale metal bowls, which reflect the shapes of the world’s oceans with their own salt water hydro-cycle. The three Atlantic, Indian and Pacific sculptures replicate the shape of the largest oceans, and each bowl holds a saline solution that, due to evaporation, will transform the work over time. Taking inspiration from scientist James Lovelock’s Gaia theory – of the earth as an interconnected super organism – Kovats reflects on water as the connective element on our blue planet. As part of the exhibition, visiting students can also see Kovats’ All The Seas, where over 200 seas are represented in a collection of glass bottles with extracts of ocean water in, gathered by a network of volunteers across the globe. Tide is a further highlight of the collection of artwork, and is a live digital drawing of the United Kingdom that tracks the seas’ tides in real time. Teachers organising a visit to the Museum of Science and Industry will find there are plenty of other things to do on a school trip (unrelated to the Evaporation exhibition). A dedicated schools programme is available for students alongside any temporary exhibitions plus the chance to take a self-guided tour (with a teacher). There are also school workshops available for all Key Stages, covering topics from electricity circuits and energy generated from explosions to how steam engines work and the possibility of flight. Teachers looking to book a school trip should call 01618-330027 or e-mail learning@msimanchester.org.uk.